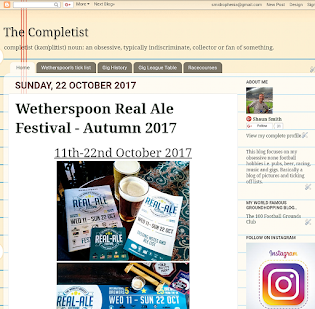 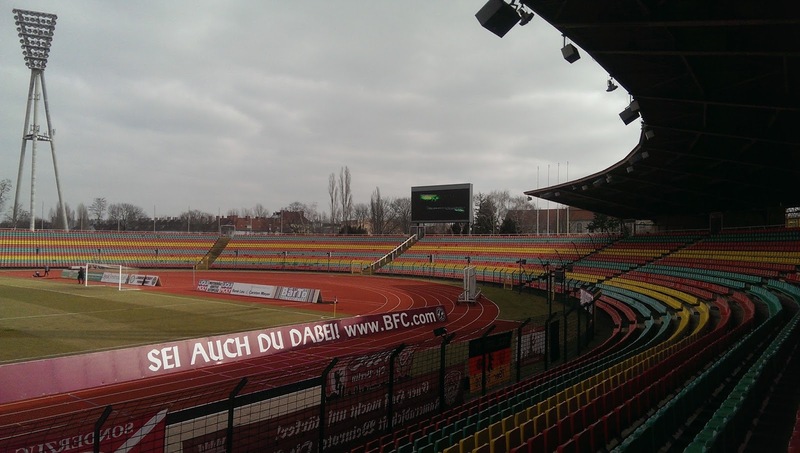 For our latest Euro city break, the breadknife and I headed over to Berlin for four nights, jetting out of Newcastle on the Wednesday afternoon. I wasn’t expecting to see much football while in the German capital, with just the one match lined up on Saturday afternoon because of the international break. 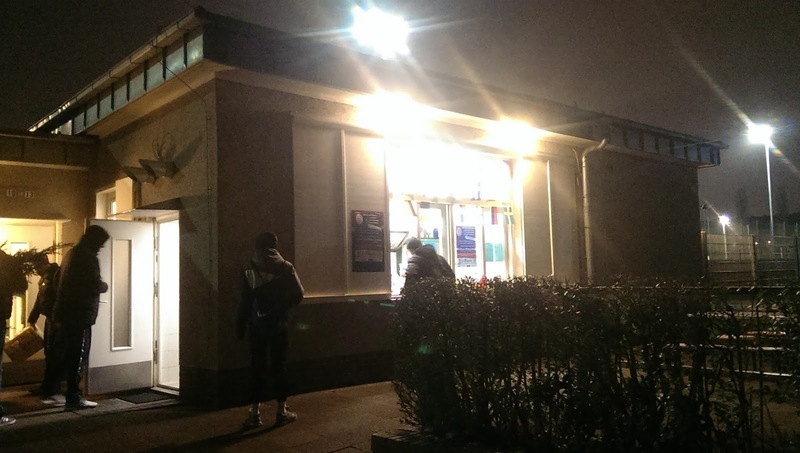 I contacted Berlin based Groundhopper Marc Wördehoff (100 FgC Squad#16) prior to the trip, for an info on matches taking place on Thursday or Friday night. 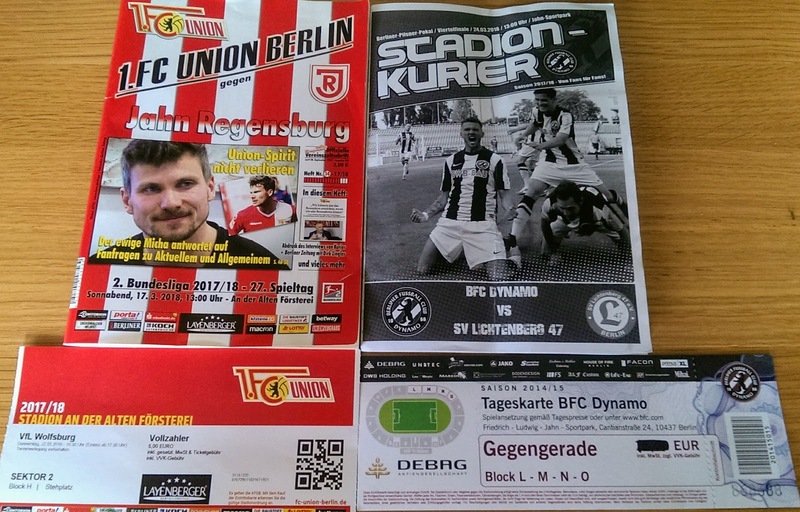 When we checked into our hotel at 7pm, I logged on to their wifi and was greeted with a Facebook message from Marc, letting me know of a further two matches on those nights to turn this holiday into a groundhop and a Berlin trilogy. 1. 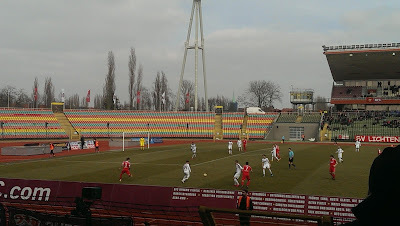 FC Union Berlin can be traced back to 1906, when predecessor FC Olympia Oberschöneweide was founded. 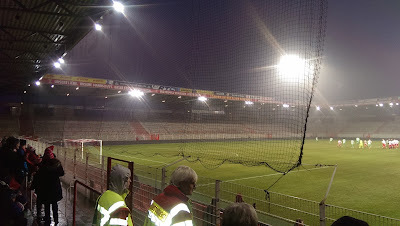 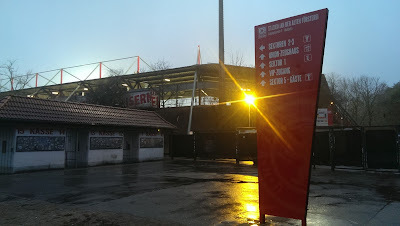 The eastern branch of the club went through a number of name changes: Union Oberschöneweide (1950), BSG Motor Oberschöneweide (1951), SC Motor Berlin (1955), TSC Oberschöneweide (1957), TSC Berlin (1963) before finally becoming 1. 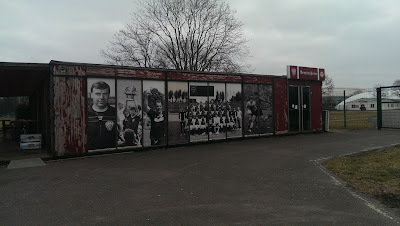 FC Union Berlin in 1966. 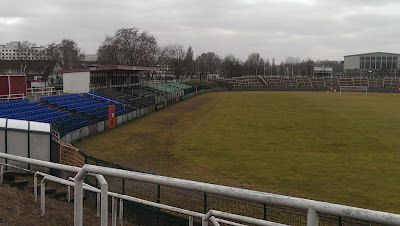 Stadion An der Alten Försterei (translation: Stadium at the old forester's house) has been their home since it opened in 1920. 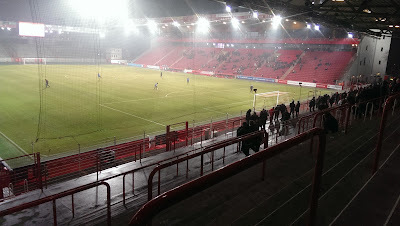 The stadium was last redeveloped in 2009 and expanded in 2013 bringing the total capacity to 22,012. 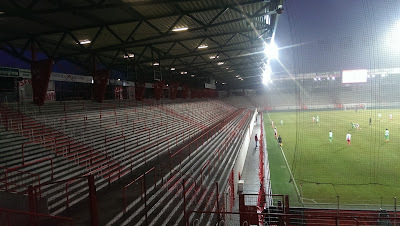 The ground has three sides of large covered terracing with the main stand at one side, which has a single tier of 3,617 red seats with sponsorship boxes at the top. The stadium also hosts the annual "Weihnachtssingen" (Christmas Carols Event) and the "WM-Wohnzimmer" (World Cup Living Room) in 2014. 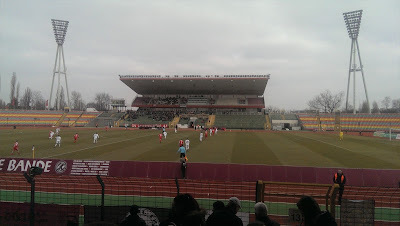 The Iron Ones, who have played in 2. 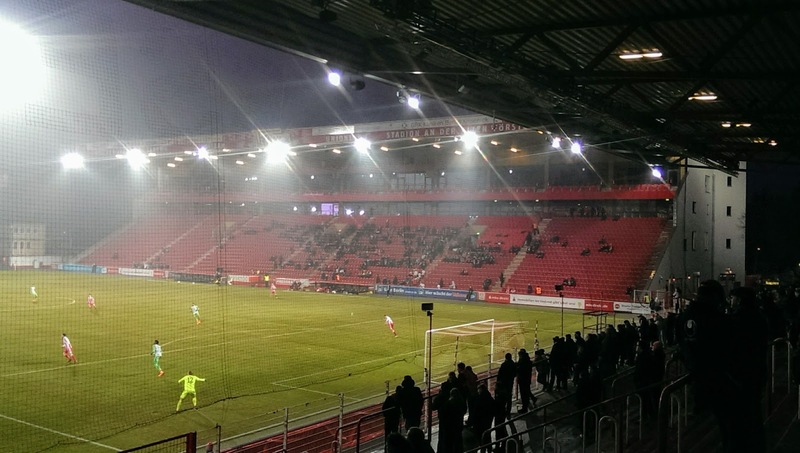 Bundesliga since 2009 faced top division opponents VfL Wolfsburg in a test spiel during the international break. 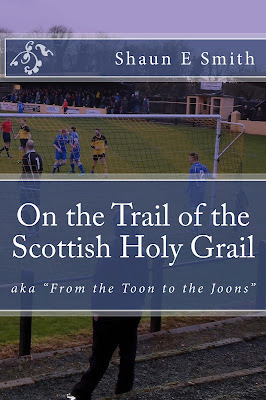 The match was an even contest until the visitors shifted through the gears in the second half. 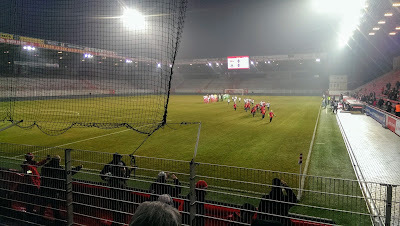 The deadlock was broken with a sweet free-kick from the edge of the area from the Brazilian defender William in the 72nd minute, before Victor Osimhen tapped in the second and Blaz Kramer ran half the length of the pitch to get on the end of a left wing cross in the last minute. 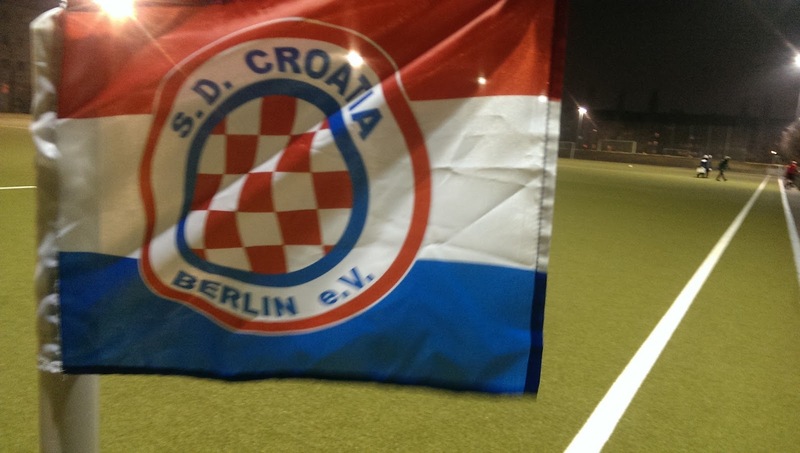 Croats are the fifth largest foreigner group in Germany, with over 400,000 Croatians currently living in the country. Sportsko Društvo Croatia Berlin was founded in 1972 by Croatienämmingen as NK Hajduk Berlin. 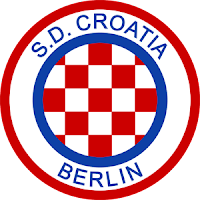 In 1987 they merged with SC Bratsvo 1971 Berlin to become SC Bratsvo-Hajduk Berlin, followed by a number of smaller clubs coming into the fold, until finally on the 14th January 1989 they teamed up with SV Croatia 1987 Berlin becoming the present day SD Croatia Berlin. The new club began climbing the leagues, going from the eighth level to become the first Croatian club to reach the third tier - Regionalliga Nordost in 1998, be it just for one season. They are currently in Berlin-Liga. 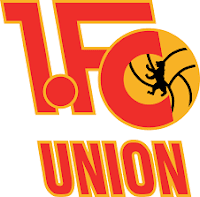 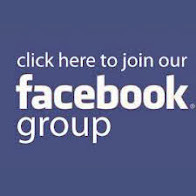 The club also has a very successful Futsal team which has won honours at both local and national level as well as playing in the UEFA Futsal Cup. SD Croatia are based in east Berlin in the Tempelhof-Schöneberg district. 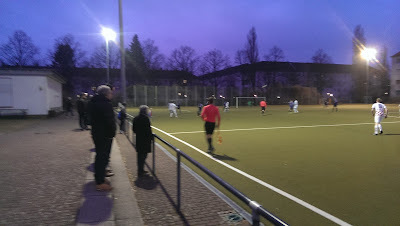 They play home games at the 12,000 capacity Friedrich Ebert Stadium, but for this friendly with Tennis Borussia the match was played on the AstroTurf pitch on the left side of the complex. 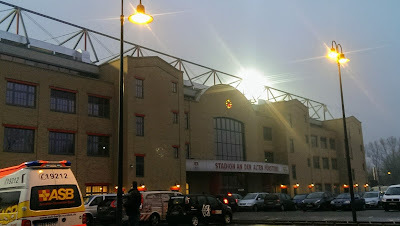 I would have tried to take some pictures of the main stadium, but it was impossible due to it being a night time match. 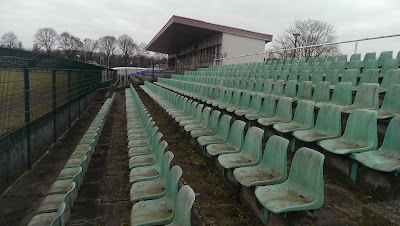 The AstroTurf pitch has standing raised steps on one side with some set back bench seats. At the entrance there’s a refreshment kiosk, with the changing room block in the centre of the complex, in between both grounds. Croatia had a comfortable warm up win against Tennis Borussia, with the big centre forward being on hand to tap home twice in the first half an hour. 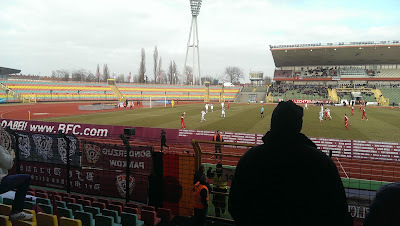 A minute after going two goals ahead, TeBe halved the deficit when the midfielder broke forward to latch onto a long ball and finish well. 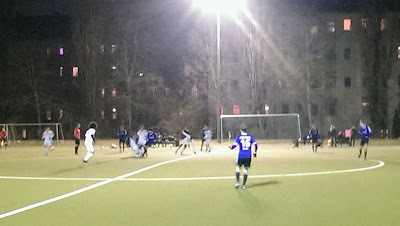 The two goal lead was restored just before the break and the victory was sealed late on to make it 4-1. 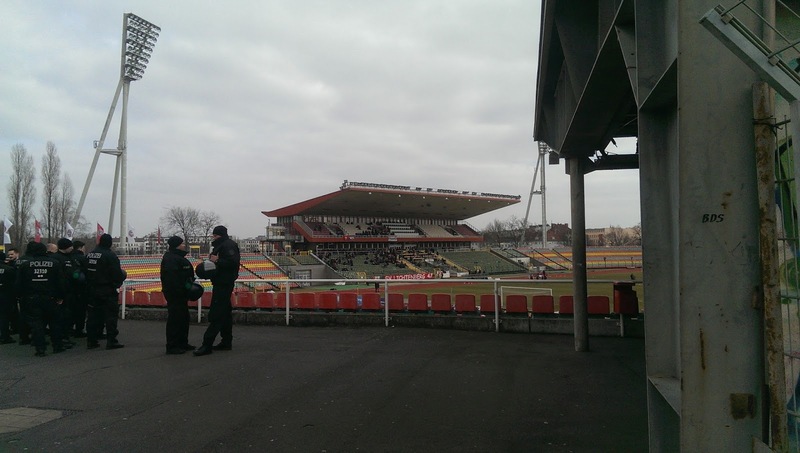 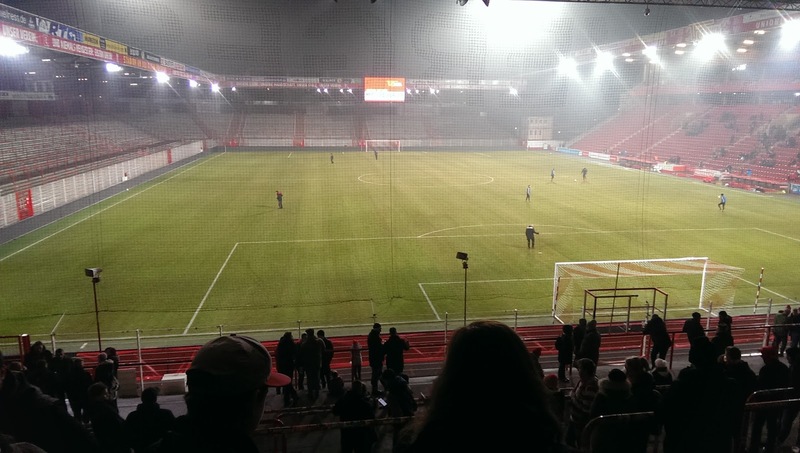 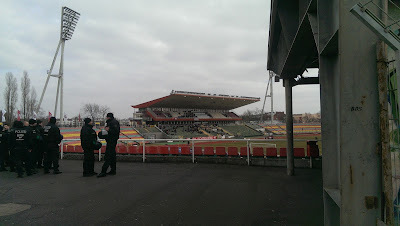 On Saturday I visited BFC Dynamo but beforehand checked out their other stadium - the Sportforum Hohenschönhausen. 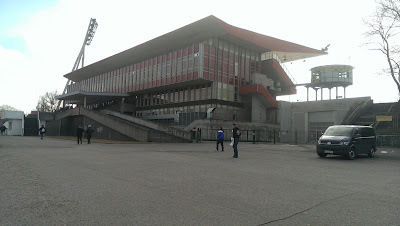 The stadium has a capacity of 10,000, including 2,000 seats and forms part of a large sports complex with facilities for ice hockey, speed skating, athletics, cycling as well a 3G football pitch. 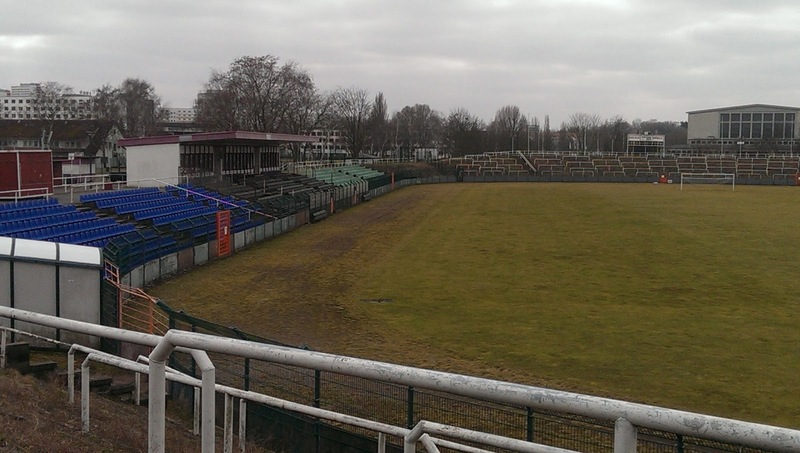 Dynamo switched most of their big European Cup matches from Hohenschönhausen to the Friedrich Ludwig Jahn Sportpark and following their 2014 promotion to Regionalliga Nordost, moved permanently back to the stadium in Prenzlauer Berg in northeast Berlin. 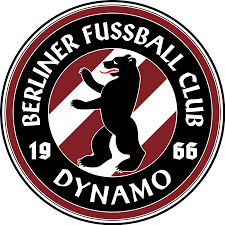 Berliner FC Dynamo were originally established in 1949 before reforming in its current guise in 1966. 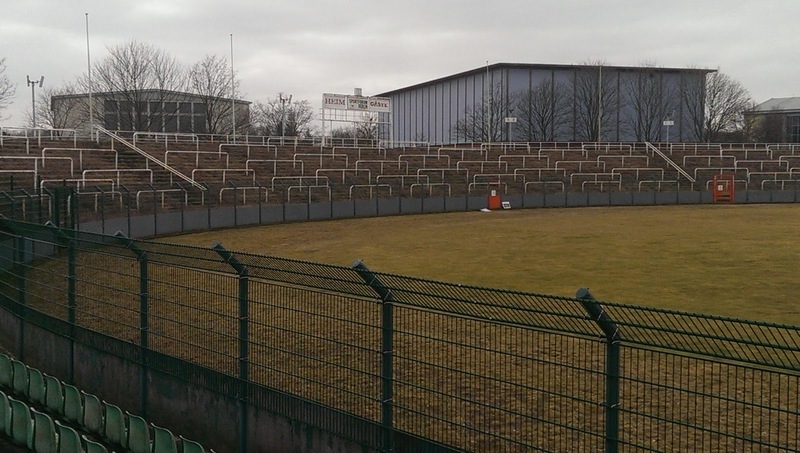 The club has a long and chequered history, as an all conquering record breaking club in the DDR, with links to the Stasi, dodgy referees and their fall from grace to the lower echelons of the German leagues. 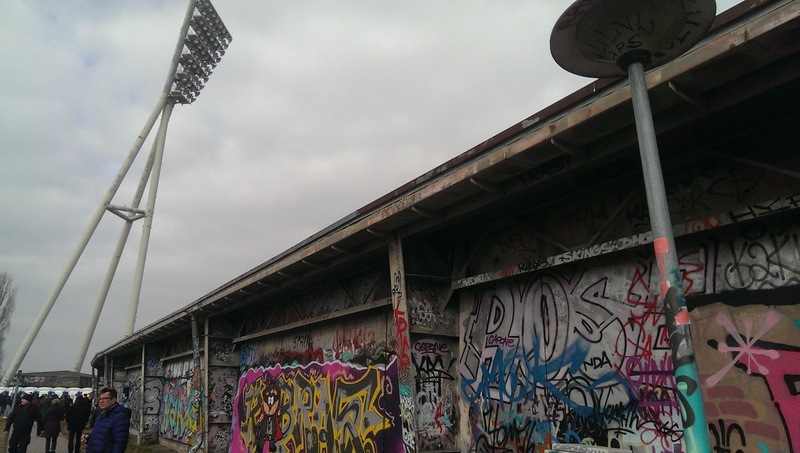 Instead of me doing another poor write up, may I point you in the direction of two cracking reads which gives a fascinating account of this historic east Berlin club on Fussball Stadt and Mondo Fotbol. 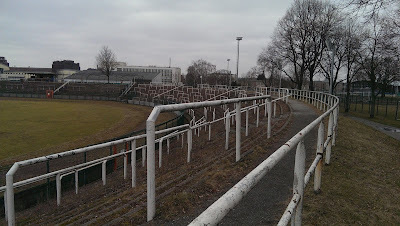 Since 1825, the area was used as the drill grounds of the Guard Regiment of the Prussian army. 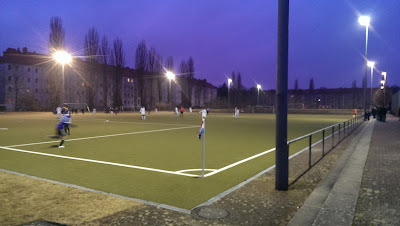 Some housing was constructed on the site late in the 19th century, but the area soon became an open space used for sports. 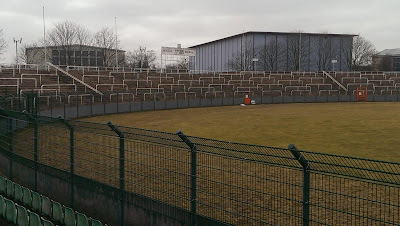 In the late 19th century the site served as the ground of Hertha BSC, until the city of Berlin purchased the land in 1912 and developed it for sports use. 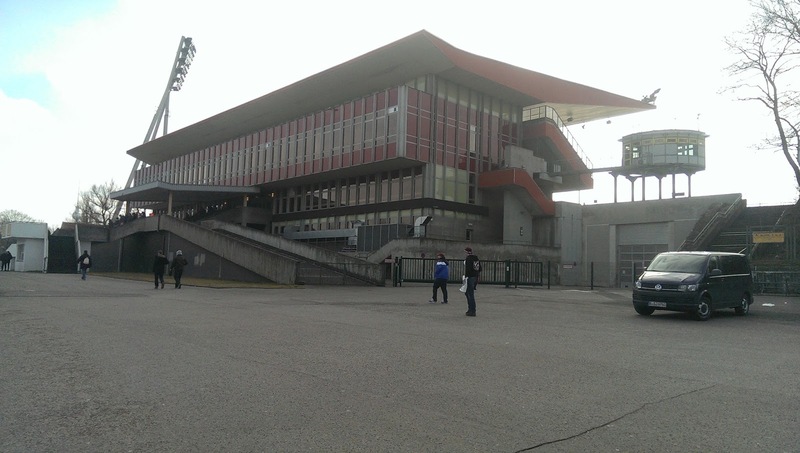 The 30,000 capacity football and athletics stadium was built on the site in 1951, for use during the World Youth Festival that year. 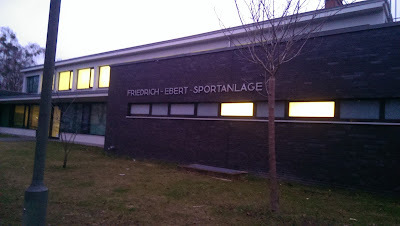 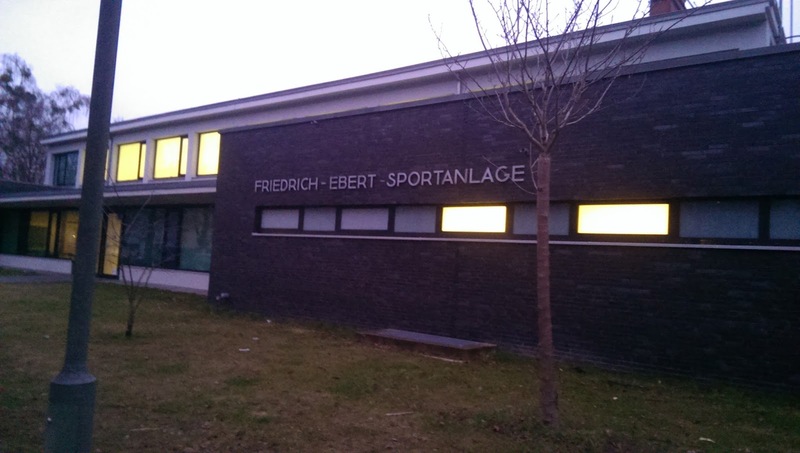 Originally known as Berliner Sportpark, East German municipal officers renamed it Friedrich-Ludwig-Jahn-Sportpark the following year in honour of the centenary of the birth of the man known in Germany as the father of gymnastics. The stadium is located in the southern part of the borough of Pankow right next to Mauerpark, a public linear park beside the former Berlin Wall and its Death Strip. The current ground was refurbished in 1988 to a capacity of 19,708 seats which are covered at the sides. 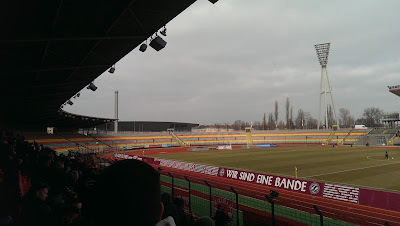 The multicoloured seats swarm around behind both goals towards the main stand, which has two tiers with a cantilever roof. 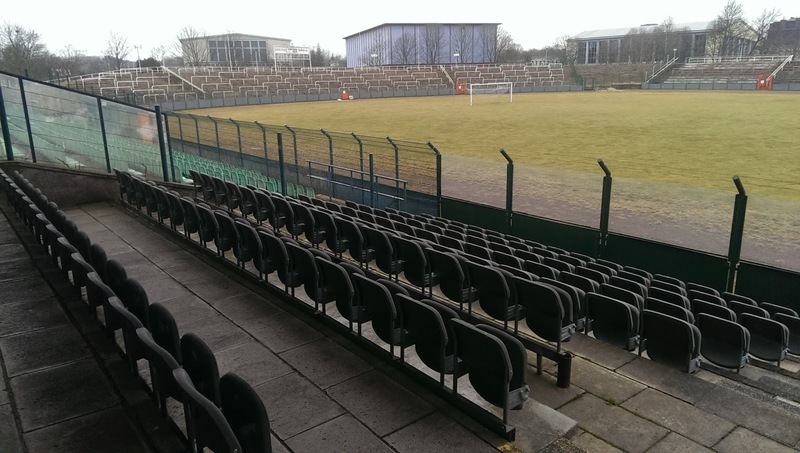 Apart from its colourful seats the most striking feature is the set of corner floodlights, which appear to be leaning forward to shine onto the pitch from the outside. 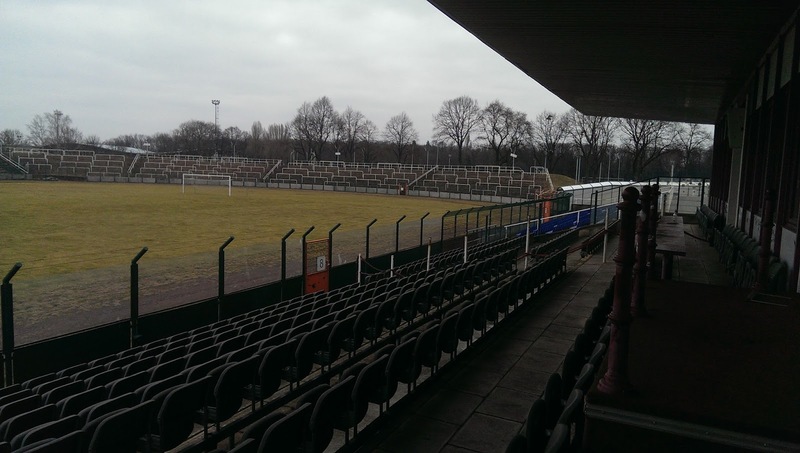 The record attendance was 30,000 for a match between East Germany and Belgium in March 1974. 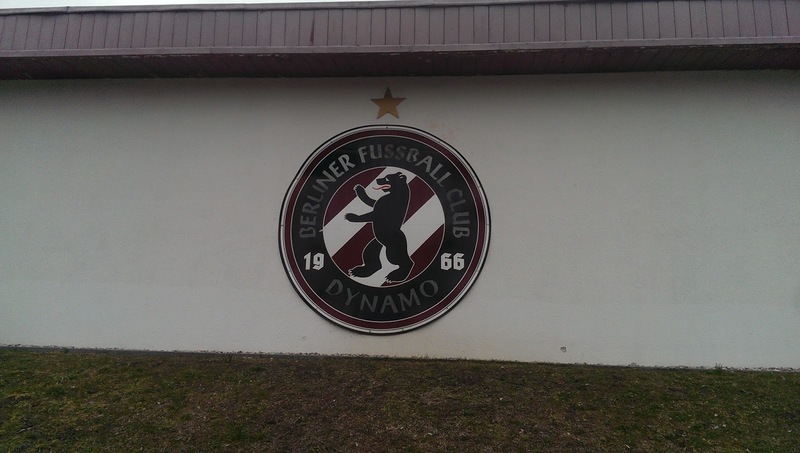 Dynamo eased past SV Lichtenberg 47 in their defence of the Berlin Cup, with Solomon Okoronkwo giving them an early lead, before Otis Breustedt raced through on goal to double the lead just before the half time whistle. The result was never in doubt once Okoronkwo added his second with a superb overhead kick from a right wing cross. The holders will now face Tennis Borussia in the semi-finals in their pursuit of a sixth Berlin Cup title. 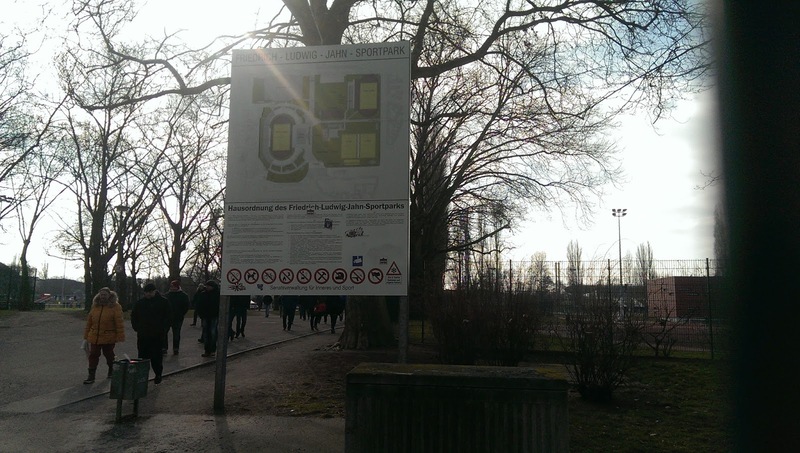 We had a fabulous time in Berlin, visiting the usual tourist spots like the Brandenburg Gate and Checkpoint Charlie. We also visited the DDR Museum, did our own David Bowie trail and of course supped some quality beers in some of the city’s top pubs and the holiday was topped off by my visit to these three great clubs in east Berlin.